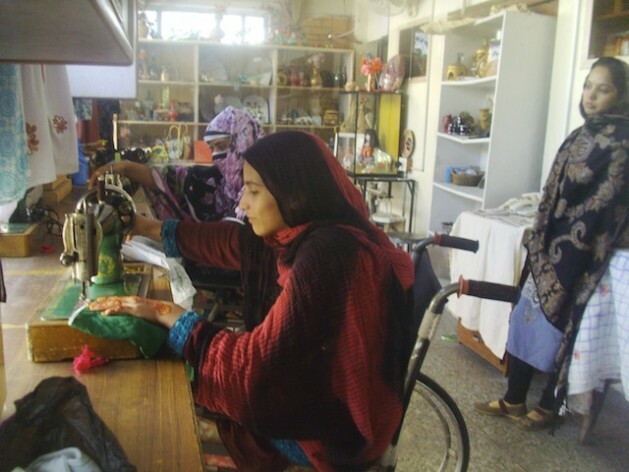 PESHAWAR, Pakistan , Nov 24 2014 (IPS) - When a stray bullet fired by Taliban militants became lodged in her spine last August, 22-year-old Shakira Bibi gave up all hopes of ever leading a normal life. Though her family rushed her to the Hayatabad Medical Complex in Peshawar, capital city of Pakistan’s northern-most Khyber Pakhtunkhwa (KP) province, doctors told the young girl that she would be forever bed-ridden. Bibi fell into a deep depression, convinced that her family would cast her aside due to her disability. Worse, she feared that she would not be able to care for her daughter, particularly since her husband had succumbed to tuberculosis in 2012, making her the sole breadwinner for her family. In the end, however, all her worries were for naught. Today Bibi, a resident of the war-torn North Waziristan Agency, part of Pakistan’s Federally Administered Tribal Areas (FATA), is a successful seamstress and embroiderer, and is skillfully managing the affairs of her small family. She says it is all thanks to the Paraplegic Centre of Peshawar (PPC), the only one of its kind in Pakistan, where she is currently undergoing intensive physiotherapy. Already Bibi is showing signs of recovery, but this is not the only thing that is making her happy. According to PPC’s chief executive officer, Syed Muhammad Ilyas, the majority of those who suffer injury to their spinal cords remain immobile for life, unable to work and fated to be a burden on loved ones. “Breaking a bone or two is one thing,” Ilyas tells IPS. “Breaking one’s back or neck is another story altogether. “Unlike any other bone in our body, the spine, or back bone, not only keeps our body straight and tall, it also protects the delicate nervous tissue called the spinal cord, which serves as a link between our body and the brain,” he asserts. If this link is severed, a person can literally become a prisoner in their own body, losing bowel and bladder control, as well as the use of their legs. The physical aspect of such an injury alone is enough to plunge a patient into the deepest despair; but there is yet another tragic twist to the story. As a result, finding employment for paraplegics is just as vital as offering physical therapy that might help them regain the use of their lower bodies. “This is why we have employed experts who teach tailoring, computer sills, dress-making, glass painting and embroidery to our patients,” Ilyas says. Most families travel between 100 and 400 km to reach the Centre, but their efforts are always rewarded. In addition to skills training, the PPC offers individual and group counseling sessions, all part of a holistic treatment programme aimed at helping patients find dignity and self-worth, to be able to function on their own after being discharged from the PPC. This has certainly been the case for 40-year-old Muhammad Shahid, who suffered a backbone injury in the Swat district of the Khyber Pakhtunkhwa province back in 2008. “All credit goes to the PPC, which enabled me to become a working man. Otherwise, my family would have starved to death,” he tells IPS over the phone from his hometown in the Swat Valley. The PPC was established in 1979 by the International Committee of the Red Cross (ICRC) to provide free treatment to those wounded in the 1979-1989 Soviet War in Afghanistan. Later, the KP government took control of the facility, opening it up to locals in the tribal areas. The Centre has been a godsend for the thousands who have sustained injuries in crossfire between militants and government forces, who since 2001 have been battling for control of Pakistan’s mountainous regions that border Afghanistan. Director-general of health services for Khyber Pakhtunkhwa, Dr. Waheed Burki, says more than 40,000 people, including 5,000 security personnel and 3,500 civilians, have been killed since 2005 alone. A further 10,000 have been injured. Burki says about 90 percent of those who frequent the PPC were injured in war-related incidents. But Amirzeb Khan, a physiotherapist at the Centre, says that the patients are not all victims of violence. Some have sustained injuries from road traffic accidents and small firearms, while others suffered spinal cord damage as a result of falls from rooftops, trees and electricity poles. “The majority of the patients are between 20 and 30 years old, which means they fall into the ‘most productive’ age-group,” Khan tells IPS. Many of these young people come to the Centre fearing the worst; yet almost all leave as productive members of society, armed with the skills necessary to make a living despite being confined to a wheelchair. Those with minor injuries have even learned how to walk again. In a country where the average annual income is 1,250 dollars, according to government data, the cost of treating spinal injuries is far greater than most families can afford. In places like the United States and Europe, experts tell IPS, rehabilitating such a patient could run up a bill touching a million dollars. By offering their services for free, and developing low-cost technologies and equipment, the PPC has closed a yawning health divide in a vastly unequal country, at least for paraplegics. An administrator named Ziaur Rehman tells IPS that plans are afoot to turn the PPC into a ‘Centre of Excellence’ for patients with spinal cord injuries from all over the country and the region over the next five years. The hope is to create a multiplier effect, whereby those who receive training here will take their newly acquired skills and pass them on to their respective communities. A living example of this is 24-year-old Shaheen Begum, who now runs her own embroidery centre in the Hangu district of KP. Immobilised by a back injury in 2011, she underwent rigorous physical therapy at the Centre, while also learning computer skills and fabric painting. “Now I am imparting these skills to women in my neighbourhood and my children are in good schools,” she tells IPS happily.